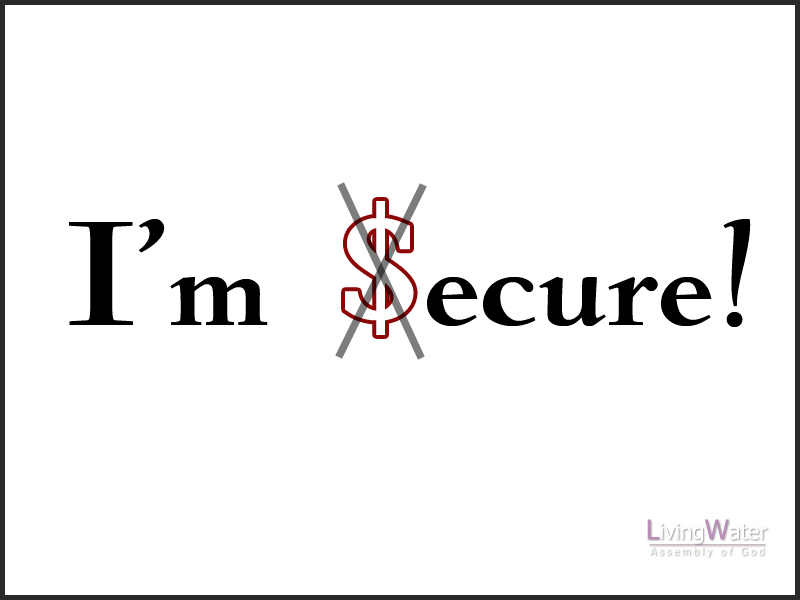 Sermon – Pastor Tim – I’m Secure! 1 Timothy 5-16, Now godliness with contentment is great gain. 7 For we brought nothing into this world, and it is certain we can carry nothing out. 8 And having food and clothing, with these we shall be content. 9 But those who desire to be rich fall into temptation and a snare, and into many foolish and harmful lusts which drown men in destruction and perdition. 10 For the love of money is a root of all kinds of evil, for which some have strayed from the faith in their greediness, and pierced themselves through with many sorrows. During the worldwide financial crisis many people were affected: many have said or thought, “This can’t be happening. What is secure anymore?” The whole world has been affected. Paul goes on to tell Timothy, 11 But you, O man of God, flee these things and pursue righteousness, godliness, faith, love, patience, gentleness. 12 Fight the good fight of faith, lay hold on eternal life, to which you were also called and have confessed the good confession in the presence of many witnesses. As we talked about last week, tragedy and hard times tend to jolt our thinking. Our best plans and hopes can be shattered by events beyond our control. We are reminded that there is only One source of security in this changing world. With new appreciation we consider Paul’s words in 1 Timothy 6:17-19, Command those who are rich in this present age not to be haughty, nor to trust in uncertain riches but in the living God, who gives us richly all things to enjoy. 18 Let them do good, that they be rich in good works, ready to give, willing to share, 19 storing up for themselves a good foundation for the time to come, that they may lay hold on eternal life. When our resources diminish, we can grow richer in good works, generosity, and sharing with others. If or when financial stability returns, we can hold more loosely to what we are given, solely trusting in God, knowing that in all times, our security is in God alone.